Peter McLachlan provides double bass tuition in various styles for all age groups. He also caters for AMEB exam preparation, has recording facilities, conducts regular studio recitals and concerts, and runs a 4-day annual double bass workshop with international guest teachers and performers. The character timber and mud brick studio is located in Belair, in the Adelaide Hills, a 20-minute drive south from the city. It is on the 196 and 194 bus route, and near the Pinera train station on the Belair line. 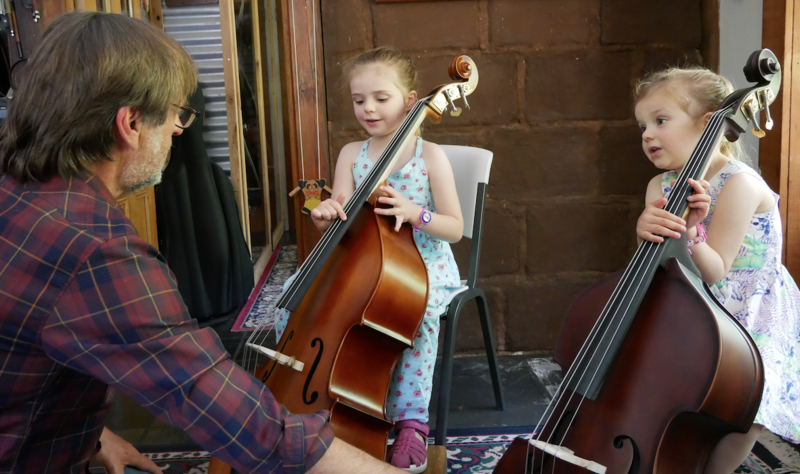 Group lessons are available at the BassWorks Studio for students who are 5 and older. The group lessons consist of up to 4 students and parental attendance is essential for students under 12 years. Group lessons, while sometimes chaotic are a great, affordable way to learn bass. The students are encouraged by their peers’ success, and healthy competition between students also motivates speedy progression. Click here for a blog post Peter McLachlan wrote about group classes. Cost: Lesson cost is $15 per student for a 40-min group lesson. Lessons are charged by the 9-week term. Individual lessons, for those who would prefer one-to-one tuition, are offered to all ages, with repertoire and resources adapted to suit the student. Parental attendance is essential for students under 12. Cost: Lesson cost is $35 per 30-min individual lesson. Lessons are charged by the 9-week term. Orchestral experience classes are for advanced students only. Included in the cost is a 30 minute class each week and a 2 hour rehearsal with an orchestra. More information can be found here. Cost: $35 for a 30 minute individual lesson per week, charged over a 9 week term. Students at the BassWorks Studio receive a 50% discount on double bass hire, $110 per term.